Which MBA For What Profession? Of late the value of a business degree has been under some amount of scrutiny. Which has most definitely lead to a lot of debate and transition of this course. The transformation of a traditional full time MBA course to the digital hemisphere has caught on as the latest trends. Even with the internal transition, the truth still remains – MBA is still has a lot more value as compared to any other non-professional degree or diploma. This course, gives a jump start to any professional’s career. With higher pay and a better job profile – companies still go for a B School graduate, especially if you are from one of the most renowned ones. Master’s in Business Administration’s 2 year course (let it be online or traditional) is carefully planned and strategized to make their students well rounded for the corporate sector. The first year is focused on giving brief idea on various management oriented subjects. Towards the end of the first year specialized subjects are introduced, which is also carried onto the second year. The second year, the specialization subjects comes out to shine. This specialization would be the rest of your career. 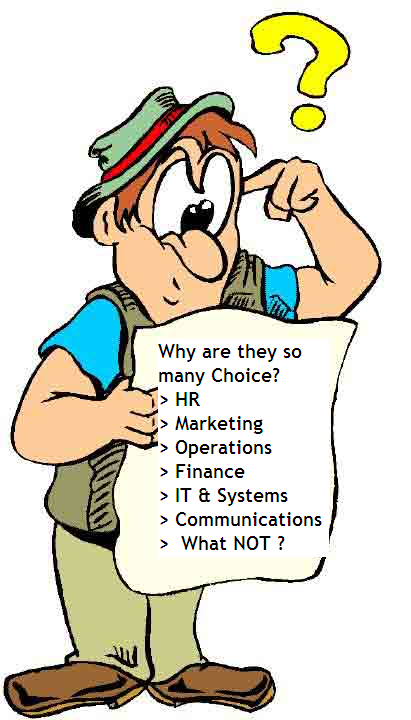 – Here are few top specializations and what kind of career they have. The same concept is used in a more compact manner for a one year or an executive course. MBA in HR: Those who are looking for a career in Human Resources and strategy – MBA in HR it best suited for them. Understanding mergers, acquisitions, company policies, labor laws, economics, recruiting, retaining etc. are the core requirement of any good HR manager. This course enables to do exactly that. MBA in Sales: This is what runs the market. The sales team of any company is the profit earner. The best way to gain access into a prestigious firm as a Sales Representative is by pursuing MBA in sales. Though sales and marketing is covered under one banner, as they are generally part of the same teach. Both also have the same aim – to make their product popular among their target audience. MBA in Marketing: This is an extremely dynamic and a competitive field. If you are looking for a profile in the marketing department of any company – this course is best suited for you. People who have good communication skills and resource mobilization skills – they can excel in this field. The degree teaches subjects like consumer behavior, market and its concepts, advertising and other related field, that helps you make an individual a great marketer. MBA in Finance: This degree is specifically made for all those finance enthusiasts. If you enjoy numbers and love being in-between money – Finance Business Degree is perfect for you. You would get an opportunity to learn subjects like costing, budgeting, international finance, capital management etc. and get into any top notch corporate company in their financial department. MBA in Rural Management: This is one of the courses that are perfectly suited for a developing or an underdeveloped country. If you want to work in the development field and the social sector – Rural Management teaches you how to do that. This unique program is introduced to suffice the demand of managers with a background in rural business. There is a potentiality of growth and increase the importance of corporate and development organizations. MBA in Operations: Understanding shop floor management or production management, product development and design etc. is the niche of an MBA graduate in Operations. They learn how to maintain process flows, inter departmental and vendor relationships etc. Most engineering students prefer to go from this degree, though any graduate can apply for this course. There is a plethora of MBA specializations in the market today, and new ones keep on propping up. The best part of a business degree, is its versatility. You can pursue this course, irrespective of your bachelor’s degree. You could be an engineer, a banker and a lawyer, an arts, science or commerce student – B schools allow you to pursue this course.